There are three light and airy guest rooms, a single, a double and a family room. These are not en-suite, but each has its own wash basin. The three bedrooms share a bathroom in an area of the building which is exclusive to B&B guests. 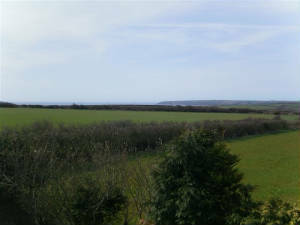 The family room has a view across the fields to the sea, while the single room looks to open country and the double room looks over the village street. Each room has its own TV, offering the range of freeview services. Downstairs two TVs can show different Sky channels. The basic rate is £30 per person for one night and includes a substantial traditional breakfast. The rate reduces for longer stays, or for couples sharing a room. Children are accommodated at a reduced rate depending on age, and whether they are sharing with parents or occupying their own room. To pay a little more for en-suite rooms with four stars, Fields Lodge (B&B only) is next door but one to the Taberna.